Apna Recharge uses the most compatible APIs to handle all the DTH recharges. This has made our recharge portals to recharge to almost all DTH services provided in India. 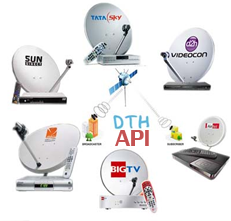 Tata sky, dish TV, Big TV, Reliance digital TV are few among the numerous DTHs our API supports. With India being digitalized DTHs are being adopted by the population at a staggering rate. We aim to simply the DTH recharging to an extent that it can be done easily from your device that has access to the internet, and our makes it possible to create a seamless experience to do so.